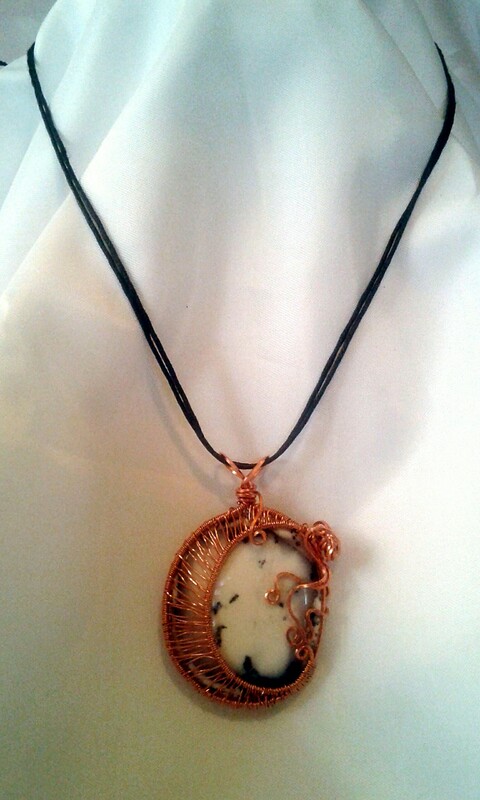 While the idea for this pendant was inspired by a picture a friend sent me, I deviated from the model a good bit, first by using an oval cabochon, instead of round, then by substituting the coated black wire used on the model with copper. The copper wire is completely naked, therefore you can expect the finish to darken with age. The cab is a large one, at 38 x 45mm; the total pendant size is 1 3/4 x 2″, not including the bail. I see it suspended from a black satin ribbon, but cord or chain would be equally appealing. 37.00 plus shipping; available in the Etsy Shop!